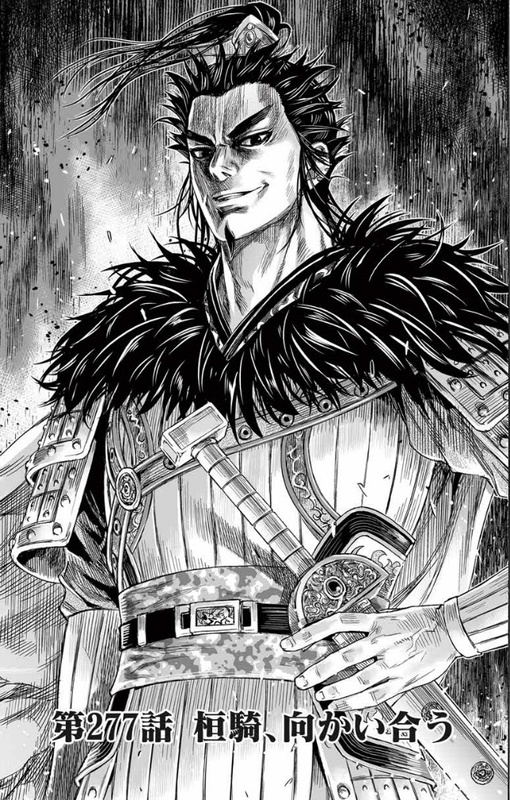 Get latest kingdom キングダム 421 Spoiler or Discussion at mangaspoiler.com. if you would like to discuss the Spoiler or prediction, please leave a comment below. -SBK seems shocked to hear the word “world”* coming from Ryo. As a Ryo follower for 10+ years, SHK agreed and even though he regarded him as one of the most notorious prime minister/chancellor in Qin’s history together with Shang Yang and Fan Ju(google these 2 names if you are interested). It seems like both SHK and SBK agree that indeed they have yet grasp the full capabilities/power/caliber(*器量, i have no idea how to translate this word) of Ryofui. * “world”(天下, directly translated to: “under the heavens”) refers to the world currently known to the Chinese, which consists of the current 7 states and the less civilized tribes and people outside China that they know of. Can’t wait until that father & son combo gets their heads cut off by Shin. This chapter was nice. I wonder what the hell Ryofui is talking about though? Raw is out, but looks like a chapter with very little, if any, progress. This chapter looks so good. Going to be some good dialogue this chapter. -As Ryo and Sei were continuing their conversation, the door to the chamber opened, with Rui, Rishi, Saitaku and Queen Dowager entering the chamber. -As they entered, Sei tells Ryo that he has investigated and knows it was Ryo who sent Rao Ai into the harem and gave him power. With this, Sei continues to dig out all the atrocities Ryo did against him, including the events during Seikyo’s rebellion 7 years ago, the assassins he sent to assassinate Sei and the fact that Ryo killed Seikyo in Tonryu with his underhanded tactics. However, he did not pass judgement on him despite all these. -Sei promised that this time, after the Battle of Kanyou ends, he will strip Ryofui off all his powers and throw him off his seat of power. -Of course, Ryofui seems calm and he said that for that to happen, the king’s faction must win the battle of Kanyou first. -No matter who wins the battle, it is certain that a new set of policy and rules will govern Qin the next day so he wants everyone to hear their conversation here. -Short cutscene to Kanyou where Shin rushes towards the back of the enemy army who opened the gates to the palace. -Back to the meeting, Sei wants Ryo to justify why unification of China is a crazy dream. -Ryo starts by mentioning the beginning of the “world” they know of today, which to him, is money. Money, or to be exact, the monetary system, was the greatest invention and discovery to men(according to Ryo). Yo everyone chapter 424 translation plsss its amazing Ei Sei is sweating!! translation please for 424!! THANKS! -Chapter starts with a flashback of young Ryofui and his master looking at a battlefield nearby. They were the ones who sold the soldiers the weapons for that battle. -While young Ryofui was really interested in the idea of selling weapons, his master was against the idea and commented that this is an exception as they needed money and they were offered 5 times the usual price for their weapons. -Young Ryofui thinks war is just part and parcel of human nature. He also commented that even though the warriors sacrificed their lives in the battlefield, the ones that benefitted the most are those giving them commands in the heart of the state. -He thinks that if he had the resources, he can definitely generate more benefits from it than these people who have no idea how to use money efficiently as the most powerful weapon in the hands of people is neither the spears nor the halberds, but in fact, money. -Ryo thinks that it is the desires of Man that they have to control, not money itself, in order for a state to prosper. While his master thinks that they as merchants shouldn’t think about this, young Ryofui thinks that he isn’t just a merchant as he plans to climb to the highest point possible and gain control of everything. -Back to the meeting between Ryo and Sei, Ryo continue to reinforce his point, stating that it was the concept of money that caused the human desires to go out of control today. -He then gave us a short history lesson about the Shang dynasty, before the invention of money when barter trading was popular. As food and resources decay and rot after travelling long distances, people invented money, which was easy to transport and does not decay. However, the problem that money brought was the concept of wealth as people would tend to use it as comparison between themselves, which results in greed as people would always want to “own more than others”. -Thousands of years later, as the monetary system replaced the barter trade system, the world developed into the much more complex “China” they know of today, which is a result of Man’s boundless greed. Soon after, the words “under the heavens” (天下) appeared. The world in the past was allowed to exist due to the mercy of the “heavens”(天) and everything under the heavens(下) is under the rule of it. When the concept of “under the heavens” became “China”, people started to think that they are able to rule the world by themselves. -Sei than summarized it as “money=everything”, which Ryofui agrees. Sei then thinks that if Ryofui does take the throne, he will sculpt China into a world ruled by desires and greed. Ryofui rebuts that it is better than uniting China through the bloodshed of war. -Ryofui furthers explains that as a ruler, he will not encourage bloodshed and instead create happiness within his country using his methods. -Saitaku questions Ryofui how is he going to rule the country with money and Ryofui promises that he will make Qin the wealthiest country in the history of China within 10 years, with more than enough resources for everyone, end hunger and create a utopia where people will live their lives in happiness. -Saitaku then further questions whether it is possible to achieve this in the chaotic world they are in. Ryofui thinks that it is possible because they are living in a chaotic world. When Qin prosper and their people filled with happiness, the happiness will attract people from other states into Qin. When that happens, the ruler of other states will start to express their friendliness towards Qin, building a peaceful relationship with Qin and Qin will become the center of the entire China. When Qin becomes the heart of the entire China, China could then be developed and accommodate all through economy and not force. Ryofui thinks this is how China should be ruled. -Next, he thinks that Sei’s method of defeating others and uniting China through force should not be the way as when that is achieved, there will be a winner and 6 losers instead of a united China. This will create tragic future where plundering, killing and bloodshed will be everywhere, war orphans would be left in despair cursing Qin for their actions, leading to the darkest times in the history of China. -Finally, he tells Sei that if Sei thinks that this is an acceptable price to pay then Sei can only be described as “mad” and Sei is the least worthy person to sit on the throne of Qin. -The purple light surrounding Sei can only be seen by Rui and Sei. -Sei starts by rebutting Ryofui, saying that his idea is unable to escape the imagination of a mere civil court official. -He thinks that Ryo’s rule will only serve to extend the chaotic era as when the other states accumulate enough wealth, wars will inevitably start again. -He rejects Ryo’s idea of “human nature” and thinks that war could end. -He thinks the greed and violence of Man today is not their true nature. By not identifying the true nature of Man and dismissing the possibility of eliminating all violence, mankind will never progress no matter how much effort they put in and it is this exact reason that the chaos in China continued for 500 years. -With some flashback of his days in Kantan, recycled from the past chapters, Sei says that the the true nature of Man is “Light”(wtf? ).